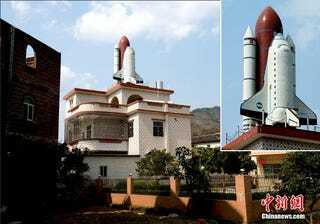 According to Chinese site Xinhuanet, a 60-something year-old farmer in Guangdong province built this space shuttle replica and put it on top of his house. I can't think of a better place for it. As you can see in these photos, courtesy of Xinhuanet and PCOnline, the statue, which is covered in tiles, certainly makes the house stand out in a truly awesome way. The shuttle doesn't actually say "NASA," but it does have what looks to be an American flag. Which house is yours? Oh, the one with the space shuttle on it.